We present a brief overview of random matrix theory (RMT) with the objectives of highlighting the computational results and applications in financial markets as complex systems. An oft-encountered problem in computational finance is the choice of an appropriate epoch over which the empirical cross-correlation return matrix is computed. A long epoch would smoothen the fluctuations in the return time series and suffers from non-stationarity, whereas a short epoch results in noisy fluctuations in the return time series and the correlation matrices turn out to be highly singular. An effective method to tackle this issue is the use of the power mapping, where a non-linear distortion is applied to a short epoch correlation matrix. The value of distortion parameter controls the noise-suppression. The distortion also removes the degeneracy of zero eigenvalues. Depending on the correlation structures, interesting properties of the eigenvalue spectra are found. We simulate different correlated Wishart matrices to compare the results with empirical return matrices computed using the S&P 500 (USA) market data for the period 1985–2016. We also briefly review two recent applications of RMT in financial stock markets: (i) Identification of “market states” and long-term precursor to a critical state; (ii) Characterization of catastrophic instabilities (market crashes). 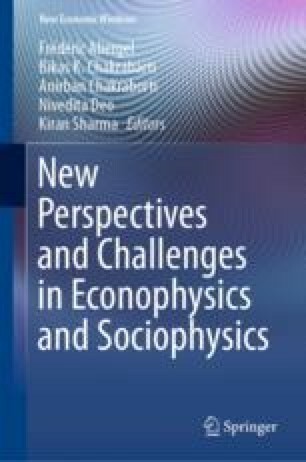 The authors thank R. Chatterjee, S. Das and F. Leyvraz for various fruitful discussions. A.C. and K.S. acknowledge the support by grant number BT/BI/03/004/2003(C) of Govt. of India, Ministry of Science and Technology, Department of Biotechnology, Bioinformatics division, University of Potential Excellence-II grant (Project ID-47) of JNU, New Delhi, and the DST-PURSE grant given to JNU by the Department of Science and Technology, Government of India. K.S. acknowledges the University Grants Commission (Ministry of Human Resource Development, Govt. of India) for her senior research fellowship. H.K.P. is grateful for postdoctoral fellowship provided by UNAM-DGAPA. A.C., H.K.P., K.S. and T.H.S. acknowledge support by Project CONACyT Fronteras 201, and also support from the project UNAM-DGAPA-PAPIIT IG 100616.